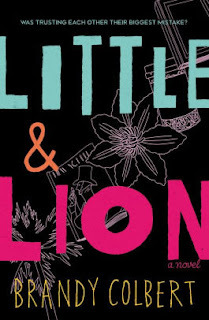 Little (Suzette) was sent away to boarding school a year ago after her older brother Lion(el) suffered a psychic break and was diagnosed as bipolar. Returning home for the summer, she discovers that her old friends have turned against Lion in the meantime, despite the fact that he appears to be better. Meanwhile, Little is suffering from issues of her own. During the school year, she discovered that she had a romantic interest in her roommate. But when the relationship that the two girls are having is discovered and the pair are outed, Little panicked and abandoned her lover. Now, she feels guilt over her betrayal that is compounded by her uncertainty over her sexuality. Things are pushed to a crisis when Lion announces that he's going off his meds and then blackmails his sister to keep quiet about his intentions. Little finds herself anxiously watching as Lion's condition worsens. An interesting story combining several issues -- not only mental illness and sexual identity, but also biracial families. I found the result busy and felt that the many different threads never quite came together. I also felt that the crisis between Lion and Little was contrived, never quite believing that Little had enough motivation to keep quiet as her brother suffered. But at the same time, the characters were interesting and I cared about them, and I enjoyed their story.